What Is Cupping? How Can It Benefit My Health? In the last decade or so, cupping has dramatically increased in popularity, as evidenced by the round bruises noticeable on a number of celebrities and athletes. Massage therapists may offer cupping to enhance sports performance, increase overall health, address musculoskeletal issues, and target acupuncture or acupressure meridian points—the potential benefits of cupping are many. This traditional Chinese medicine practice has many similarities to acupressure, acupuncture, and gua sha, all of which use physical interventions to balance and facilitate the flow of chi. However, as cupping is mentioned in the Ebers Papyrus, the world’s oldest medical text, ancient Egyptians may have been the first to use cupping. In short, this popular modern practice dates back to the earliest records of medicine, and its use is supported in many cultures. Traditional Chinese physicians have used vacuum pressure to treat muscular tension, pain, and breathing ailments as far back as medical practices have been recorded. Today, cupping practitioners draw the air out of glass cups with hand pumps, though the traditional method, which involves heating the cups, might still be used. When the special cups are heated and placed on the skin, the air inside expands and escapes. As the cups cool, suction is created, and this suction holds the cups tightly against the skin, keeping air from entering and drawing skin up into the cup, stretching and loosening the tissues. Like gua sha, cupping draws blood to the surface of the body, triggering hormonal reactions that stimulate healing and fight inflammation. Dr. Brent Bauer, director of the Mayo Clinic’s Complementary and Integrative Medicine Program, highlights the dual nature of this traditional practice, saying we should consider the use of treatments that have stood the test of time but avoid using them simply because of their age. Some traditional and complementary treatments have been debunked by contemporary medical practitioners—but many others have been validated by a number of doctors and other health care professionals. What Symptoms Does Cupping Treat? The Egyptians used cupping to treat pain, vertigo, fever, and irregular or difficult menstrual cycles. They also used it to stimulate appetite and speed up the body’s natural healing process. Today, we know cupping releases muscle adhesions, relaxes soft tissues (so they can release toxins and heal faster), and stimulates the lymphatic system. Chi (also “ki” and “qi”) is a much-debated concept. The word refers to the living energy in all of us, other living things, and the world in which we live. Today, scientific researchers have just begun to observe the physical manifestations of the life force known as chi. Shin Lin, a UC Irvine biology and biomechanics professor (and high-level tai chi practitioner) uses cutting-edge devices to measure the heat, electricity, and photons emitted by the body during various tai chi exercises. A number of actors and other celebrities have been seen displaying cupping bruises and have spoken about their use of the practice to support fitness and well-being . This high-profile use of cupping has led many people to ask their massage therapists about combining this popular treatment with their massage therapy sessions. Chris Martin, Gwyneth Paltrow, Jennifer Aniston, Kelly Osborn, and Victoria Beckham have all sported cupping “hickies” and promoted this traditional treatment. How Does Modern Cupping Differ from Traditional Cupping? 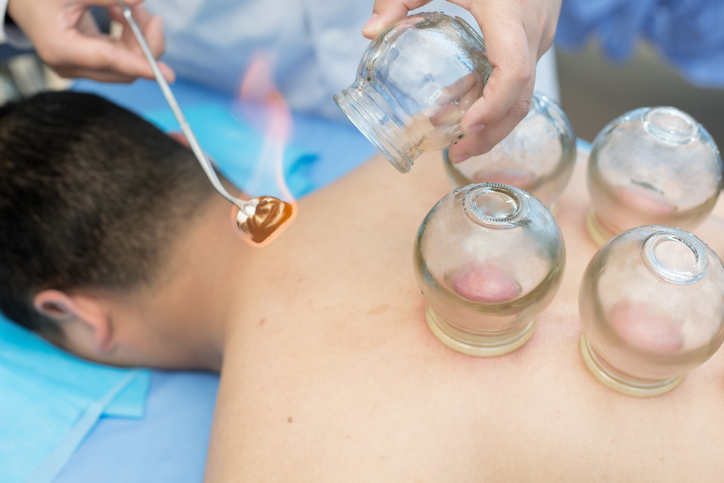 U.S. practitioners may tend to use cupping as a stand-alone therapy, while practitioners of traditional Chinese medicine typically use this treatment in conjunction with a variety of other diagnostic procedures, nutrition suggestions, and health interventions. Americans may tend to seek cupping treatments to loosen muscles and increase blood flow, while those who reside in or come from eastern parts of the world may more often seek to loosen stagnated energy and/or increase chi flow. Individuals seeking cupping treatments for the first time are likely to have many questions about the practice and its benefits. Take time to share these questions, and any reservations, with the practitioner. A good practitioner will welcome this interest and thoroughly address any concerns. Any bodywork practitioner is also likely to ask questions about a client’s health history and any pain or flexibility issues that need to be addressed. Your massage therapist may first perform a light general massage, applying further pressure to the body areas designated for the cupping session. Some practitioners may prep clients with a “glider cup,” which allows them to quickly apply suction to various body areas. A typical cupping session includes stationary cups, which are applied to the shoulders, back, hips, and legs. Practitioners may use between four and six cups at a time, leaving them attached to the body for 10 minutes or so. Cups are then applied to other body areas as needed/requested by the client. After completing a few “sets” of cupping, practitioners may conduct a deep tissue massage to facilitate further release of a client’s muscles. Cupping clients may feel some stinging when practitioners first apply cups. Glider cups may also create mild to moderate pain. Perhaps the most notable aspect of cupping is the large reddish-purple circular bruises that linger for approximately a week and may be slightly tender. However, many people find these experiences well worth the effort. In fact, cupping clients often report more and longer-lasting pain relief after cupping sessions than after standard massage therapy sessions.